What’s your beluga viewing style? A zodiac tour is ideal for photographers, videographers and wildlife lovers who prefer not to get in the water. Zodiacs are inflatable, durable boats well suited to the ocean. Operated by experienced river pilots, seeing belugas from zodiac gets you closer than on a passenger boat. If you have a large group or small children, consider an excursion on a larger passenger boat. Float alongside hoards of belugas as your guide gives you the what’s what on the friendly whales. And if you’re curious as to what’s going on under the sea, listen into the conversations of the whales with hydrophones. If you’re not a fan of the sea, take to the sky. Hudson Bay Helicopters has been operating out of Churchill for 25 years, offering sightseeing tours from the sky to see the stunning subarctic tundra and wildlife. Fly along the coast to see beluga whales as they feed their calves in the Churchill River before departing in Early August. Suited for paddlers of any level, this once-in-a-lifetime excursion takes you onto the calm waters of the Churchill River. Float the day away on a kayak as curious beluga whales play in the surrounding waters. 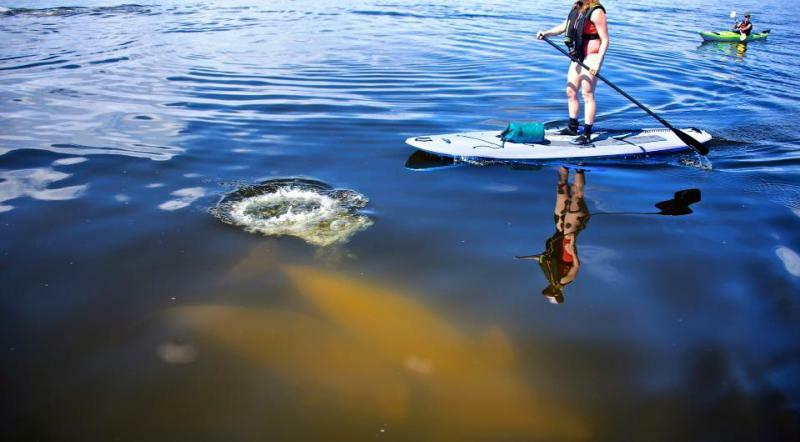 You will be amazed by how the whales interact with your kayak and paddle! The newest addition to beluga viewing is stand up paddle boarding with Sea North Tours. Don’t be afraid to jump into for a swim if you lose balance: Sea North provides top-of-the-line wet suits in case you end up alongside the whales. Tours depart during low tide to ensure smooth waters.